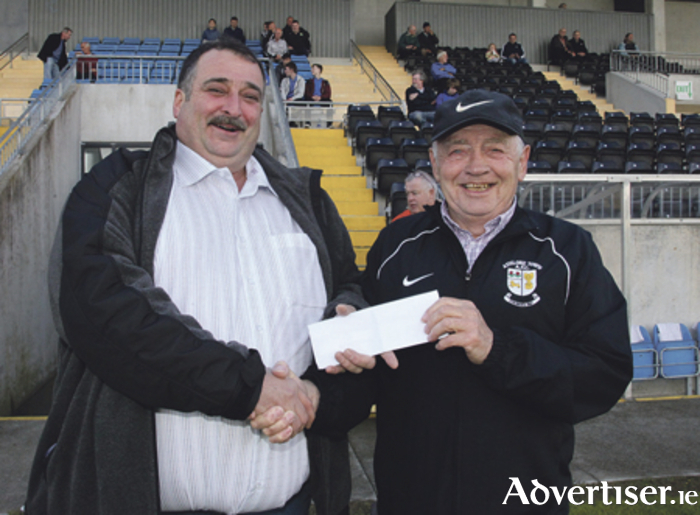 Brendan Conroy of Nuts Corner was the match sponsor for the Athlone Town v Cobh Ramblers game last weekend. He is pictured presenting the cheque to Liam Gaffey. The Athlone Town FC Supporters Trust held its inaugural meeting last Sunday, June 26, in the Shamrock Lodge Hotel where the future of the club was discussed. The meeting came hot on the heels of a vote of no confidence in the club’s current committee, issued at a meeting held in the Sheraton Hotel on Thursday, June 23. In a statement released in the wake of that meeting, members criticised the current committee’s delay in issuing a statement of the club’s affairs despite its promise to do so at a meeting held at the stadium on May 25. The Supporters Trust said the delay is “simply unacceptable” and called on the committee to disclose “the basis on which the information is being withheld”. Members said they have learned that Mr Tony Connaughton made a detailed submission to the club on June 6 requesting certain information and putting forward proposals for the future of the club. A deadline for reply was given - however no reply was received. Mr Connaughton issued a final reminder on June 7 setting a deadline for reply of 4pm on June 8. Again, no reply was received. The statement finished by calling on “all who care about Athlone Town FC”, including “those who have been hurt by the club in the past and those who have the club in their heart”, to attend Sunday’s meeting. “This is an open invitation issued to save our proud club,” it read. The call was answered as a significant number of supporters gathered in the Shamrock Lodge on Sunday. An interim committee of eight people was put in place and will meet next week to solidify the aims of the Supporters Trust. It is understood that the current committee of Athlone FC have refused to recognise the legitimacy of Sunday’s meeting. The results of the interim review being conducted by Peter McLoone are expected to be submitted in the coming weeks. Colin Fortune and Mick Dolan took charge of a much-changed Athlone team against Cobh Ramblers last weekend following the departure of Alan Mathews as manager. Fielding a number of their U19 squad, the home side started well and carved several chances early on. However, a soft goal in each half from Shane O’Connor and Stephen Christopher gave Cobh Ramblers a 2-0 away win at Lissywollen. Athlone Town FC - 128 years of history, but what future?